It’s been so long I wonder if this thing is even still on… well, here goes nothin’. Let’s see if this if I remember how this all works. DISCLOSURE: Ahh, yes gotta let y’all know about the delicious sponsor Welch’s. The internet and my life is full of my half-baked/ half-failed ideas and best laid intentions. Time to finish those up. Startin’ here, today. #BarefootInTheKitchen; #BarefootInTheKitchen my first love. That’s how I’ve spent much of this heart healthy month thus far. Growin' up Daddy was obsessed with purple from his fraternity days. I went to a college where Purple was everythin'. So, obviously I love grape juice. Plus this brand has no added sugar. Works for me cause Lord knows I don't need any added. Today my kitchen produced these little minis. 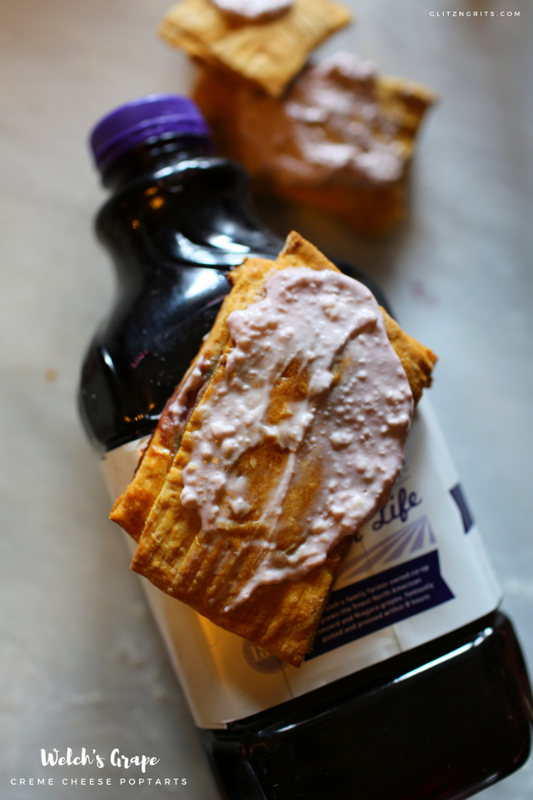 Homemade Welch’s Grape Crème Cheese Frostin’ Pop Tarts. Y’all enjoy and let me know what you’ve been up to while I was away. What have you seen? What have you listened to? What have you eaten? How is the plan to be healthier this year? First we will make the dough. 1. Mix the flour with the baking soda, baking powder and salt. 2. Fork the Crisco shortening in. Once everything is worked in mix with your hands until it becomes the consistency of corn meal. 3. Slowly add the hot water. 4. Mix with a wooden spoon and then your hands until the dough looks and feels like pie dough. 5. Place a damp towel over the bowl and let it sit for 20 minutes on the counter. 1. Roll the dough at and cut into squares. 2 Add a dollop of the jam and then brush the edge with egg wash.
3. Place a second dough square on top and then fork around the edges. 4. Bake at 350 for about 20 minutes or until the dough is cooked. 5. 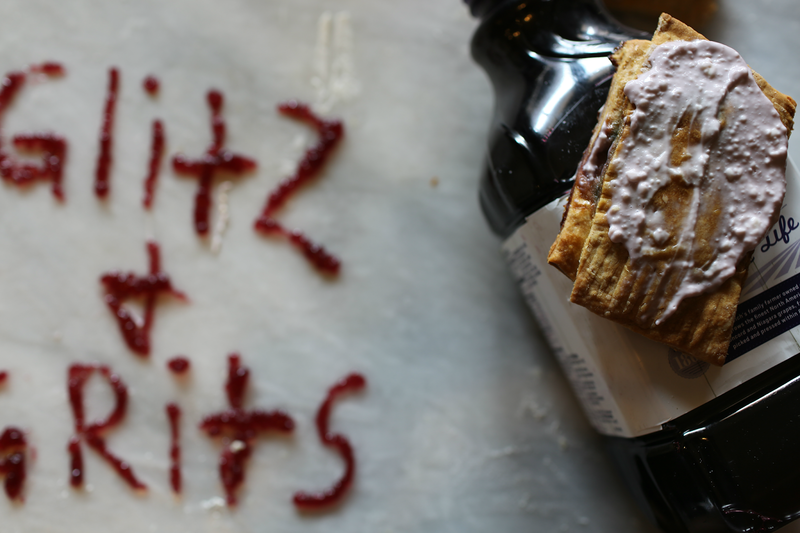 For the frostin' melt the creme cheese, Welch's 100% grape juice and agave syrup. Then pour on top.